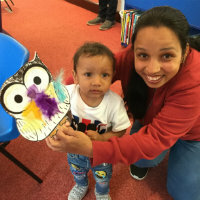 We hold Bookstart story and singing sessions and lend out storysacks and BIG Books to make storytime with your young children interactive and even more fun. 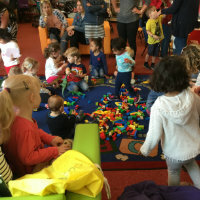 All of our libraries hold regular Bookstart Baby Bounce and Tot Rock sessions for babies and young children and their parents/carers. You can hear stories, sing, move and play with toys and instruments together. The sessions are free, informal and welcoming, with no need to book in advance. Our collection of storysacks make reading a multi-sensory experience that’s enjoyable to both parents and children. 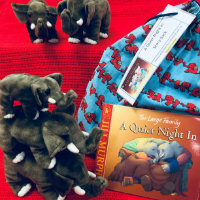 A storysack is a cloth bag containing a popular young children’s picture book as well as puppets and props to bring children’s favourite stories to life. These immerse children in the story, stimulate an interest in reading books and help develop vocabulary and social skills. Feed milk and cake to The Tiger Who Came to Tea , or help Farmer Duck and all the animals push the lazy farmer out of bed! 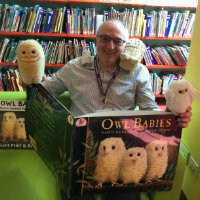 Any member of Suffolk Libraries can borrow storysacks for free. You can search for and reserve them through our advanced catalogue search by choosing ‘Story sack’ in the ‘Collection’ menu, or asking the staff at your local library. We also stock BIG versions of your favourite picture books, which are ideal for reading to small groups of children. The larger words and pictures give children a more immersive experience, as everyone can see them more easily. Any member of Suffolk Libraries can borrow BIG Books for free. You can search for and reserve them through our advanced catalogue search by choosing ‘Big Books’ in the ‘Collection’ menu, or asking the staff at your local library. Tip: Extend the fun even further with a craft activity based on a story you have read together. Don’t worry if you’re not particularly creative - there are always plenty of simple craft ideas online!